LONDON.- To mark the 250th anniversary of Captain Cook’s first voyage, the British Museum opened a new exhibition which re-examines the explorer’s relationship with the people of the Pacific. Reimagining Captain Cook: Pacific Perspectives looks at the ways Cook’s explorations are viewed in the places he visited and by descendants of the people he encountered. Objects from the British Museum’s collection associated with Cook’s voyages are displayed alongside contemporary artworks made by artists from the region. Together, these works demonstrate that the impact of his voyages remains complex, contentious and largely unresolved. The exhibition has seven sections which each focus on a place where Cook is remembered: Australia, Aotearoa New Zealand, New Caledonia, Hawaii, Vanuatu and Tahiti, as well as Great Britain. Cook’s experience of each place was different and these sections not only explore his encounters, but the varied memories that exist today on these islands. The contemporary works by artists from the Pacific Islands are all in some ways a response to Cook’s voyages, including some which are directly responding to Cooks personal possessions which he donated to the British Museum. Together they show that Islanders are still imagining – and reimagining – encounters with Cook to this day. The exhibition contains 88 objects and images, including 14 contemporary works. Eight of these have been specifically acquired by the Museum for this display and are exhibited here for the first time. Highlights of the contemporary works include Māori artist Steve Gibbs’ Name Changer which aims to restore awareness of the traditional Māori names for the region around Gisborne New Zealand, which Captain Cook renamed “Poverty Bay”. Also on display is a work by the Aboriginal photographer and artist Michael Cook whose work Civilised #12 reflects on the legacy of William Dampier, the first Briton to visit Australia (before Cook), questioning what it means to be ‘civilised’. Early European misunderstandings of Aboriginal people left a legacy still being felt today. Popular culture of the Pacific is reflected in a colourful 1970s vintage Hawaiian shirt. Acquired for this exhibition, it is the first example of the famous and ubiquitous Hawaiian shirt (known in Hawaii as an Aloha shirt) in the British Museum’s collection. The shirt features images made by artists who were travelling with Cook when he arrived in Hawaii on his third and final voyage (Cook died on these islands). Some of the 18th century prints from which the images are taken are displayed alongside. The shirt reveals how deeply the legacy of Cook continues to permeate the culture of the Hawaiian Islands. The contemporary artworks on show are now part of the Museum’s collection for the nation, collected in order to challenge the traditional dialogue around Cook and offer new perspectives. One example is New Zealand Māori artist Lisa Reihana, whose work Taking Possession, Lono was recently acquired by the Museum. The work is a still image taken from Reihana’s celebrated panoramic video work In Pursuit of Venus [infected]. Inspired by a 19th century French wallpaper design, which depicts colourful, fantastical scenes from Pacific Islanders’ lives, Reihana inserts Europeans into the landscape in order to reimagine early encounters between Islanders and Europeans. In this anniversary year, Reimagining Captain Cook: Pacific Perspectives highlights how the islands of the Pacific were transformed by their encounters with Cook, as well as how the islands transformed Cook himself. Two hundred and fifty years after he first set sail for the waters of the Pacific, his legacy continues to be debated, contested and challenged. 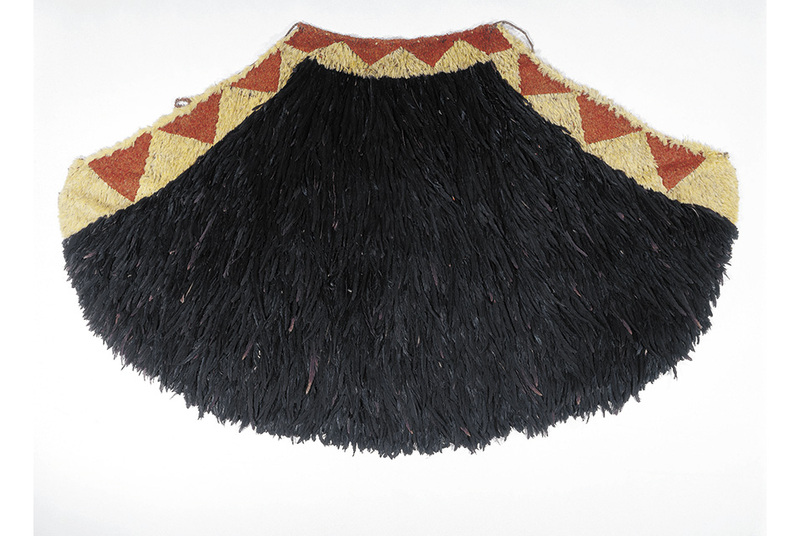 The British Museum is uniquely placed to tell the story of this ever evolving relationship through the collection – and this display is a result of a major collaboration between Pacific artists, researchers, curators and British Museum staff. Julie Adams, Curator of Oceania collections at the British Museums says: “Captain Cook represents part of a shared history between Europe and the Pacific. The stories in this exhibition, and the objects on display, present a fresh vision of Cook’s voyages, one that suggests other ways of imagining this shared history. It is an exciting opportunity for us to showcase new works made by Pacific Island and Indigenous Australian artists, which demonstrate how ideas about Cook continue to change. In another 250 years I’m sure we will still be encountering him”.